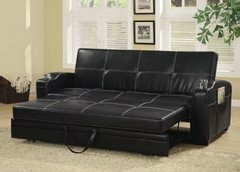 This casual contemporary sofa bed will be a nice addition to your home, helping you make the most of your space. In a luxurious black faux leather with white accent stitching, this sofa will create a bold look. Perfect for lounging by day, the deep seat and high back cushions will keep you comfortable, framed by curved track arms with convenient storage pockets for magazines and remotes and cup holders too. The back cushion drops and a smooth easy to use pull out mechanism makes it simple to convert this sofa to a spacious and cozy bed for overnight guests. Add this convertible sofa to your home for a comfortable touch that everyone can enjoy.